Deviled eggs are always a favorite appetizer. 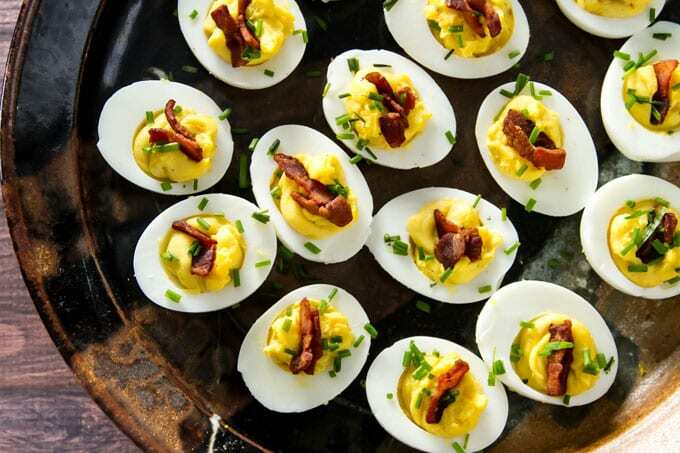 These creamy deviled eggs are topped with crispy bacon and fresh chives – they are sure to disappear fast! If you caught my post from the other day – amazing, melt-in-your-mouth slow cooker short rib sliders – and wondered what might be a good side dish I’ve got a great idea for you today. Deviled eggs are great party/game-day/it’s-just-a-random-Sunday appetizer and something I always make a beeline for – I’ve never met a deviled egg I didn’t like. And, come to think of it, I don’t think I’ve ever had the same deviled egg twice – the garnish opportunities are endless. I’d never turn my nose up to a plain deviled egg with a simple sprinkle of paprika, but, I have to say, I like mine with a little more somethin’-somethin’ on top. Like bacon. I never say no to bacon. And because I’m sharing this smack-dab in the middle of a crazy week, I’m keeping it short and sweet today. 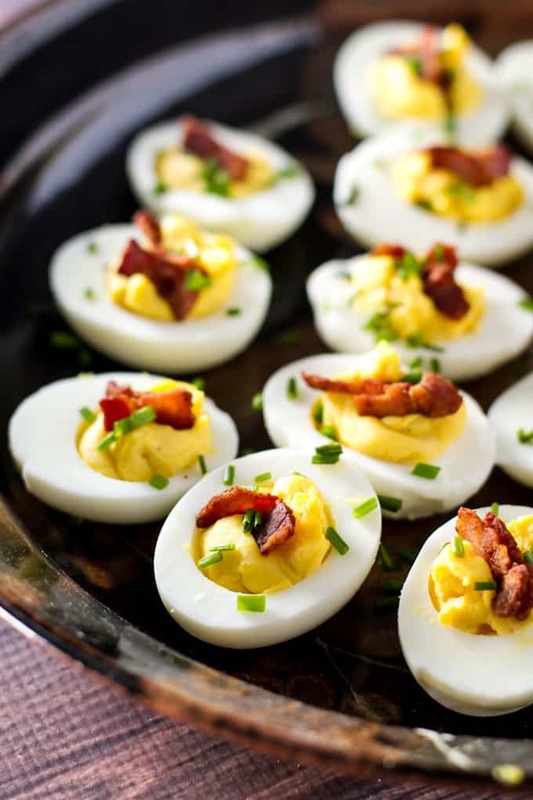 I hope you give these creamy deviled eggs with a garnish of crispy bacon and fresh chives a try – trust me, they won’t last long so make a double batch! Deviled eggs are always a favorite and the flavor combinations are endless. I love the combination of bacon, eggs, and fresh chives – these are easy to make and are so good! Place the eggs in a medium pot and cover them by an inch with cold water. Bring that pot to a boil and, once boiling, turn off the heat, cover the pot and remove it from the heat. Let the eggs sit in the hot water for 10 minutes. While the eggs are cooking, cook the bacon in a small pan over medium heat until crispy. Remove the bacon from the pan and let it drain on a plate lined with a paper towel. 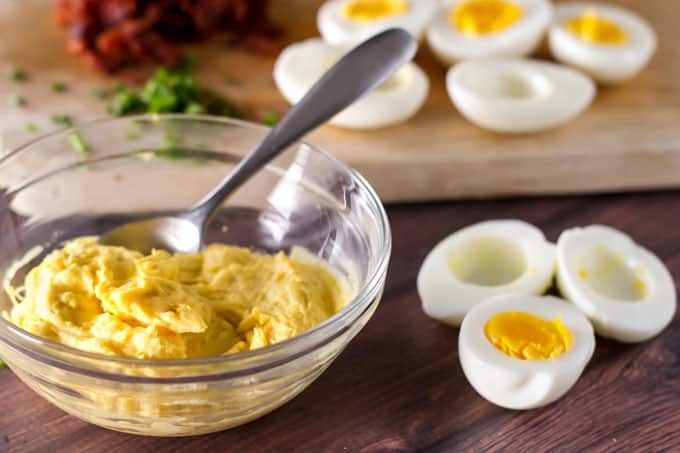 Once the eggs have cooked for 10 minutes, pour the hot water out (keeping the eggs in the pan) and cover them with cold water to stop the cooking process (throwing some ice cubes in class=”gr_ gr_69 gr-alert gr_gramm gr_disable_anim_appear undefined Grammar multiReplace” id=”69″ data-gr-id=”69″>helps, too). Let cool for about 10 minutes or so. Once they’ve cooled, remove the shells. Slice each egg in half lengthwise. Gently scoop out the yolks and place the yolks in a medium-sized bowl. Place the egg whites on a plate or serving platter. To make the filling, first mash the eggs yolks with a rubber spatula. Next, add the mayonnaise starting with just a quarter cup. Stir the two together using a rubber spatula. Keep adding a little bit more mayonnaise in batches until you get a creamy consistency. Add the mustard, garlic powder, and salt and give it all a good stir. Scoop the filling into a large zip lock bag. Give it a squeeze so the filling fills one bottom corner of the bag. Snip the corner off and then gently squeeze enough filling to fill each egg white half. Top each deviled egg with some of the bacon and a sprinkling of chopped fresh chives. Depending on the size of your eggs you may need more or less mayonnaise. I recommend starting with about a 1/4 cup and then add more until you get the consistency you like. [br][br]You can make the eggs ahead of time (up to a day ahead) and keep them in the refrigerator until you’re ready to serve them. Hold off on the garnish, though – I recommend making that the day of and topping the eggs just before you serve them otherwise the bacon won’t stay crispy. I totally agree that when these are served, they are the first appetizer completed. Love your additions. 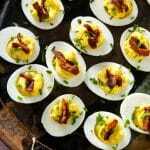 I love deviled eggs but haven’t thought to add bacon. It’s genius! A must try for sure. These are right up my alley. Great for the super bowl coming up! Yum!! Fantastic spin on this classic finger food; I especially love the bacon in it!